At the Caribbean Resort enjoy a peaceful swim and spa or an invigorating work out in the gymnasium or steam room. The Resort's adjoining Contemporary Cocktail Lounge Bar and Restaurant is perfect for a late afternoon cocktail or relax on your private balcony whilst taking in the views. 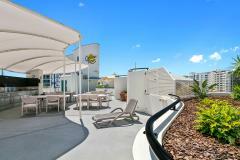 The Resort's Rooftop Spa and BBQ area is great for entertaining friends or family. Located on Brisbane Road, the main street of Mooloolaba, and ideal location as you are only 80m from teh popular Mooloolaba Beach, 120m from Underwater World and only minutes walking distance to the myriad of restaurants, bars and boutiques of Mooloolaba.